The 6th-seeded ’82-’83 Edmonton Oilers over powered the 27th-seeded ’99-’00 Florida Panthers by outscoring them 18-8 and outshooting them on average by 15 shots per game. However, what really sunk the ’99-’00 Panthers was allowing the ’82-’83 Oilers’ PP to go 7-for-13 during the series, which is an insane 53.9%. Edmonton’s offense was pretty top heavy, but with the talent they have that doesn’t really matter because the top end talent doesn’t need much support. Wayne Gretzky finished with 11 points to lead the team while his line mate Glenn Anderson was second with nine points. Gretzky and Anderson were also first and second in goal scoring for the Oilers with five and four goals, respectively. Two of Anderson’s four goals were game-winners. Jaroslav Pouzar, Mark Messier and defenseman Charlie Huddy were the only other Oilers to score more than once with two goals each. Gretzky was also tied for the team lead in assists at six with defenseman Paul Coffey. Anderson and Messier were tied for second with five assists each. In net, Andy Moog wasn’t very busy at times, but he certainly played better than his counterpart. He posted a 4-0-0 record with a 2.00 goals against average and a .935 save percentage. As stated earlier, Florida’s offense was almost non existent in this series. They only scored eight goals and only Scott Mellanby (2) score more than once over the four games. Both Pavel Bure and Viktor Kozlov went goalless after averaging at least a goal per game during Florida’s First Round matchup. Defenseman Robert Svehla led the Panthers in assists with three while there was a four-way tie for second at two assists that included Kozlov and Mellanby. With his two goals and two assists, Mellanby finished tied for Florida’s top scorer at four points with Svehla. Cam Stewart and defenseman Bret Hedican were tied for second in overall scoring with three points each. Going back to Bure and Kozlov, those two combined for 26 points in their First Round series, but only totalled three points in these four games. Any goalie facing any ’80s Oilers team is not going to have good numbers and that was the case with Florida’s Mike Vernon. He posted an 0-4-0 record with a 4.25 goals against average and an .895 save percentage. 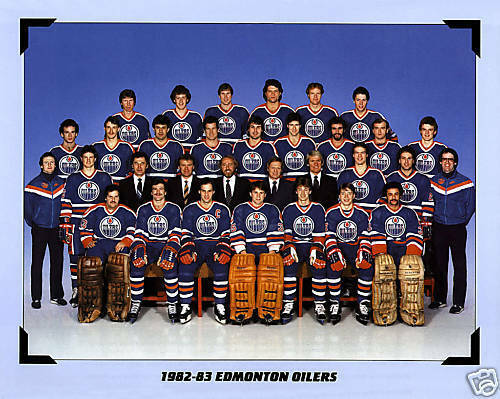 The ’82-’83 Oilers are the franchises third different Ultimate NHL Playoff representative, all of them coming from the ’80s dynasty. In the upcoming Third Round, they will either face the 11th-seeded ’98-’99 New Jersey Devils or the 22nd-seeded ’09-’10 Vancouver Canucks. The ’99-’00 Panthers made their UNP debut in last year’s tournament and made a surprising run to the Third Round. However, they failed to get there this year in their return to the tournament and that Third Round mark from last year remains the franchises best UNP appearance. Up next in the Second Round, the 12th-seeded ’84-’85 Philadelphia Flyers face the 21st-seeded ’80-’81 St. Louis Blues! This entry was posted in 2nd Round, Ultimate NHL Playoff and tagged Andy Moog, Bret Hedican, Cam Stewart, Charlie Huddy, Edmonton Oilers, Florida Panthers, Glenn Anderson, Jaroslav Pouzar, Mark Messier, Mike Vernon, Paul Coffey, Pavel Bure, Robert Svehla, Scott Mellanby, Second Round, Ultimate NHL Playoff, Viktor Kozlov, Wayne Gretzky. Bookmark the permalink.